The Search Criteria form enables you to specify criteria for a search. You can access the form in step 3 of the Create New Task process, or from a task’s Search Criteria tab when modifying a task (see Modifying an Existing Task). The Search Criteria Summary text box displays a list of the criteria currently used by the search. 1. If you are adding criteria to an existing search, click the search name in the left Search list to select it. 2. In the Select Search Criteria panel, click a field name in the list of available fields to select it. You can narrow the field list by typing part of the field name in the Search for text box. Clicking the Clear button restores the full list. 3. Select an operator from the Operation dropdown menu. Options vary according to the field’s data type. 4. Specify a value from the Value dropdown menu. Options vary according to the field’s data type and operator. • For fields that allow selecting values from a list, you can select multiple values by holding down the Ctrl key while clicking the list options. • For operators that allow multiple values, enter each value on a separate line rather than separating them with commas. 5. Click Add to Search Criteria. 6. Repeat the steps above for all fields you want to use in the search. 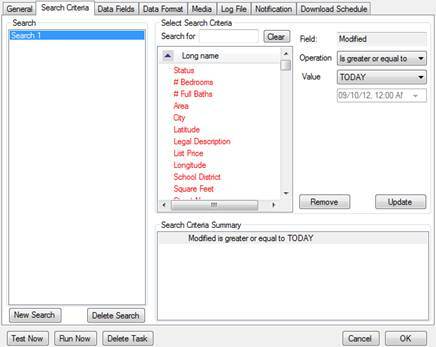 Your task will search for records that satisfy ALL your criteria. 7. If you are creating a new task, click Next. If you are modifying an existing task, click OK, or continue to another tab. 1. From the Search Criteria Summary text box of the Search Criteria form, select the criterion that you want to be first in the group. 2. 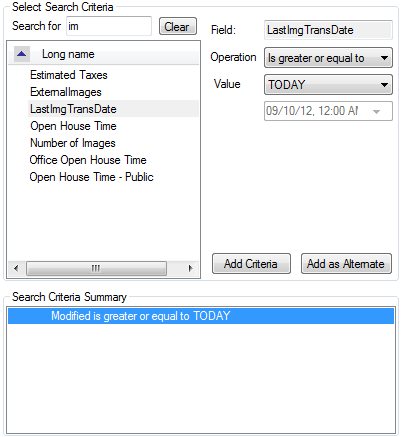 Select a field from the Select Search Criteria panel, and specify the operator and value(s) to use. 3. Click Add as Alternate. The new criterion, as well as the one you selected in the first step, appears in the Search Criteria Summary box under a group heading. 1. Click the group heading to select it. 1. Click the search name in the Search list to select it. 2. Click the criterion in the Search Criteria Summary list to select it. 3. Edit the criterion operator and/or values. 5. Repeat the steps above for any other criteria you want to modify. 6. Click OK, or continue to another tab. 4. Repeat steps 1 ̶ 3 for any other criteria you want to remove. 5. Click OK, or continue to another tab. Your search must contain at least one criterion.